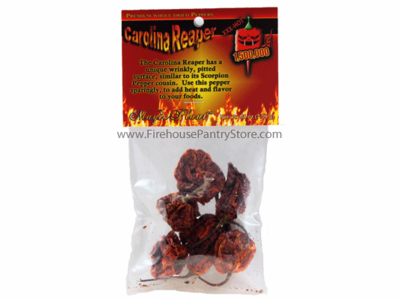 The Carolina Reaper is the hottest chili pepper on Earth, according to the Guinness Book of World Records, testing on average at 1,569,300 Scoville Heat Units (SHU). This attractively packaged packet contains whole pods - chili pepper, seeds, and stem. We think they smells and tastes of habanero peppers, with their fruity, citrus flavor. To Rehydrate Dried Chili Peppers: Place chiles in a bowl. Pour just enough boiling water over the pods to cover them. Cover the bowl with a lid or plastic wrap and allow to rest for approx. 10 minutes, or until chilis are soft and pliable. For a more intense, toasty flavor, use a spatula to press the dried pod in a hot skillet (no oil or liquid) until you see a little wisp of smoke rise, flip over the chili and repeat on other side. Then, proceed with directions above for rehydrating. Making your own hot sauce allows you to control the heat level and flavor. ~ In a nonreactive saucepan over medium-high heat, cook onion, fresh chilies, and garlic in oil until onions are translucent, about 4 minutes. ~ Add remaining ingredients, except vinegar, to saucepan; reduce heat to medium-low; simmer for 20 minutes, stirring often. ~ Remove pan from heat and allow to cool to room temperature. ~ Pour saucepan contents into a blender or food processor; puree until smooth. ~ Add vinegar to mixture; blend until combined. ~ Pour mixture into a sterilized jar with a lid. ~ Will keep in the refrigerator for 1 year. Notes: For a mild sauce, use Anaheim, Poblano, or Jalapeno. For a medium sauce, use Serrano, Cayenne, or Tabasco. For a very hot sauce, use Habanero, Scotch Bonnet, Thai, or Pequin. The World's hottest chile pepper heats up this easy-to-make and fresh-tasting salsa. ~ In a small saucepan, stir together all ingredients. ~ Bring mixture to a boil over medium-low heat, stirring often. Remove from heat. ~ For a smooth salsa, puree all in a blender, food processor, or using a stick blender. For a chunky salsa, puree only half. ~ Refrigerate salsa for at least 1 hour before serving. Spicy cream pasta with a hint of garlic. Serve with sauteed shrimp or grilled chicken to make it a meal. ~ Start a pot of water boiling for the pasta. ~ Melt butter in a saucepan over medium heat. Add garlic and Scorpion pepper and cook for 2 minutes. ~ Pour cream into the saucepan and bring to a simmer, stirring occasionally. ~ Whisk the flour into the saucepan, and then add the tomato, salt, and black pepper. Simmer until thickened, 5-8 minutes. Remove from heat. ~ While the sauce is simmering, place your pasta into the boiling water to cook (as directed on the package). ~ When your sauce is thickened, stir in the Parmesan cheese. Allow sauce to cool for a few minutes before serving over the cooked pasta.